From first look at the mysterious giant map of Africa draping the stage, holiday theatre goers knew they were in for something completely different Friday night. When the stormy gray lights come up depicting a very real giant ship with a couple clinging together on the decks to the crescendo of stormy dramatic music punctuated by thunder, the magic of imaginative theatre begins! When the couple is washed overboard and seem to be swimming underwater, you know you are not in White Plains anymore. 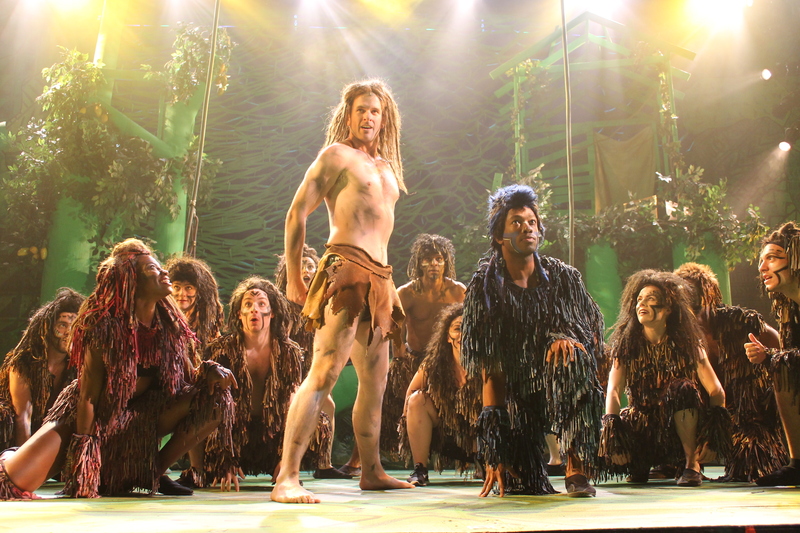 TARZAN staging is as in-your-face technologically up-to-date and inventive and sets the setting as strong as the reach-out-and-touch-your heart performances. WPPAC Director Jeremy Quinn has created the Congo of 1912 though the theatrical alchemy of lighting master Jamie Roderick and jungle designer Gabriel Firestone. 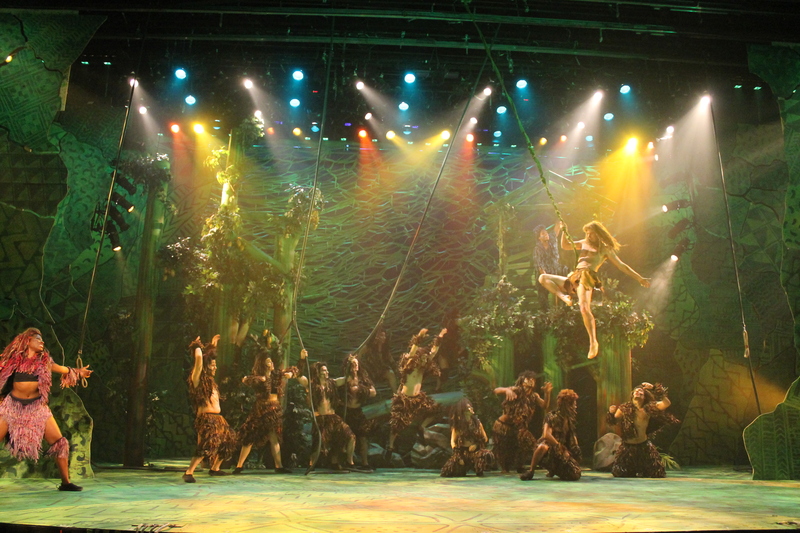 They have packed the WPPAC proscenium, creating a place where you can imagine sailing ships, explorers’ safaris, tropical gardens and scientists’ expeditions, and giant Jane Porter eating spiders and the rarest of finds “a good man,” the original superhero, Tarzan. Tarzan! With his gorilla pal, Terk, (Cartreze Tucker, foreground right whose comic plotting and snappy wisecracks provide distraction and amusement, perfectly easing the suspenseful adventure. 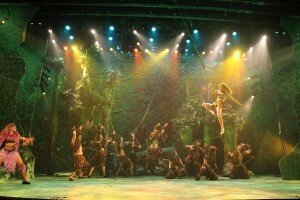 WPPAC has never before created the effects like these: the scenery, the real jungle treetops with creeping leopards, tree houses and spectacular costumes where Tarzan’s apes actually look like apes. The actors appear galvanized by their amazing environment, giving it all they’ve got. Tarzan rescues the intrepid Ms. Porter and then Jane attempts to teach him words. Well, ladies and gentleman Mr. Stevens evokes sympathy and sensitivity in the audience, as he struggles, having never seen a human being before, especially one like Miss Jane Porter. He wants to understand. Jane (Jenna Dallacco) the rescued lady research thanks Tarzan for the swoop down rescue and the electricity starts. Mr. Stevens(above, left) never portrays Tarzan as a buffoon. He plays him as genuine, trusting, trying to understand. But his grasp of what Jane (Jenna Dallacco) tells him is a measured understanding, realistic learning and he just nails that with a touching tenderness. This is not easy to act. Dallacco handles this situation with just the right, charming mix of dedicated researcher and very intrigued young woman. They are more than on the same page. Ms. Dallacco as Miss Jane Porter (on safari with her father to find gorillas to confirm Professor Porter’s (Toby Miller)theory that gorillas have family groups, is a living Walt Disney heroine personified. She even sounds like Julie Andrews with a thrilling soprano rich with nuance and precision that flows, eddies and sparkles like a stream. Her voice gets you in the heart. Ms. Dallacco just peals her songs…it’s like singing thinking out loud. Her Waiting for this Moment at the end of Act I just lights up the stage as she discovers the floral beauty and fauna of Africa. Jennifer Theriot as Kala with the feisty Korrie Lee Blossy as Kerchak, the tribal leader who has to keep up appearances. Besides the spirited/ awkward/ charming romance between Tarzan and Jane, there are the equally powerful performances of Korrie Lee Blossy in a breakout performance as Kerchak the tribe leader of the gorillas, delivering a powerhouse of a leader, (he’s the best of Idris Alba and James Earl Jone) and his wife, Kala, played by the charismatic Jennifer Theriot gives him measure for measure. The conflict: Kerchak is against Kala adopting the baby Tarzan she finds in the hut of Tarzan’s shipwrecked parents. 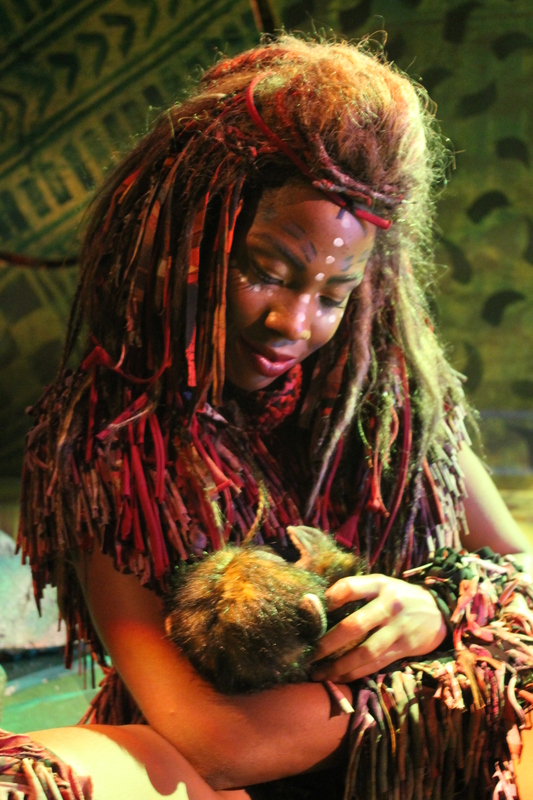 Kala has lost her child, finds Tarzan and wants him to replace the child she lost. Kerchak is against taking in the baby, because Tarzan being human, is different and will get the ape tribe into trouble. 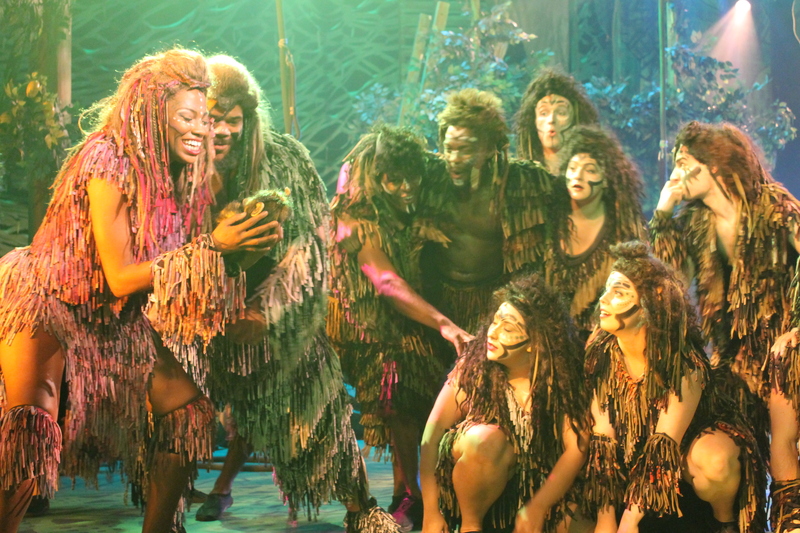 Kala’s (Jennifer Theriot above) beautiful promise to baby Tarzan in Act I You’ll Be in My Heart is a preview of her other big numbers that the audience just loves. She reprises this tear-jerker in a duet with Tarzan at the end of Act II, in a “heartable” moment when Tarzan is leaving the jungle and tragedy strikes Kerchak. 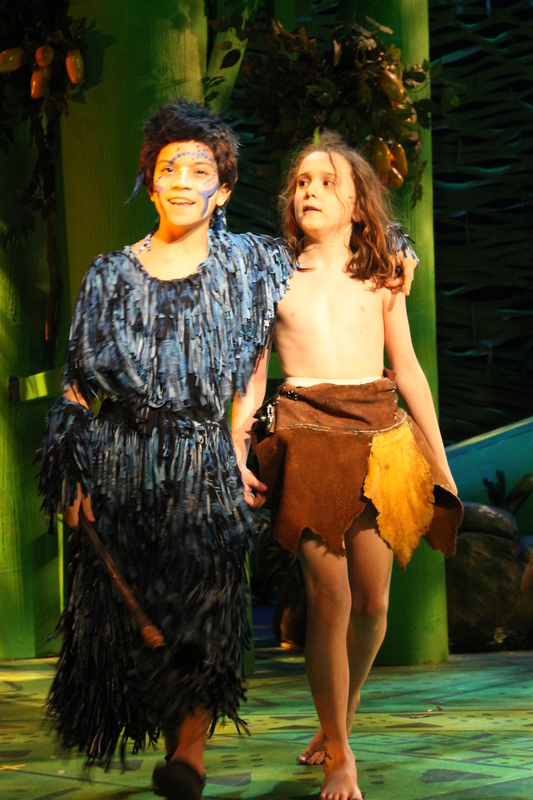 The first act delights children because there is the young Tarzan, played Friday night by Jesse Goodman, who, with his pal, young Terk (Kyle Wolf) please the youngsters with Who Better Than Me? 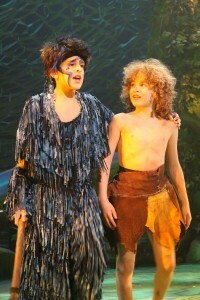 The other young Tarzan is Max Albert Vivino (above,right) The other Terk is Kyle Arzaga (above left). Act II has a lot going on: Jane is ecstatic about finding the young ape man and becomes more intrigued with him, as she teaches him in a most charming way. Her father Dr. Porter becomes a more serious version of a professor than he appeared in the first Act. 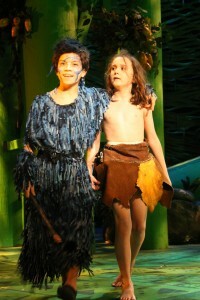 Jane (Ms. Dallacco) introduces Tarzan to her Father Professor Porter (Toby Miller). Miller provides both comic relief and homily advisories to Jane. Miller makes his changes of heart and fatherly advice completely believable. 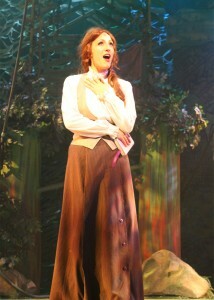 Ms. Dallacco sings about Tarzan as being Like No Man I’ve Ever Seen. A terrific number and Professor Porter knows what’s going on between the two. As the romance simmers,(and this is one musical romance that is never boring), Mr. Stevens and Ms. Dallacco sing the love song of the show, For the First Time. The two have a chemical reaction in this self-analytical appraisal—always fun and anyone who has ever felt the way Tarzan and Jane do – will recognize that old crazy feeling you never get tired of. There is villainy in the mix, Nicholas Baumgartner as Clayton, the Porters’ guide who is attempting to capture gorillas, and decides instead to capture … well you will just have to see his plot unfold in this living jungle onstage. The ensemble which portrayed gorillas in most realistic costumes and mimicked with what I perceived as realistic gorilla behavior are to be congratulated. They were very athletic with gorilla like gymnastics and high energy that drives this show. Children and parents alike will delight in the gorilla’s curious and hilarious examination of the Porters’ campsite at the beginning of Act II! The orchestra created menace, darkness, lightness and meaning to the action, (think “Quiet Village” with lots of flute and authoritative brass and pounding drums). They blend with the everchanging scenery that his a 25th actor in the show with seamless changes. Lighting, going through dawns and darknesses create a staging musically, visually consistently inventive. This “staging as character moving the plot” is the style these days, makes scenery unfold the action creating suspense before dialogue is even spoken. The staging, singing and hard-driving script builds creates excruciating drama in the second act. 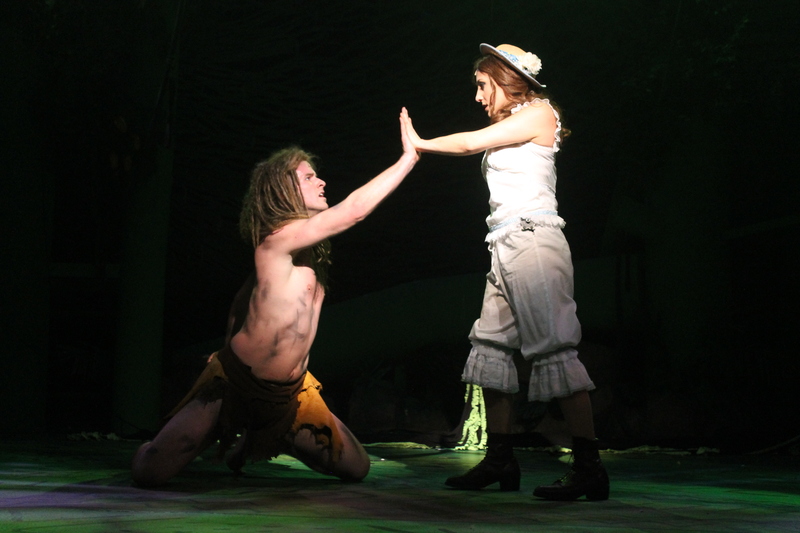 Will Tarzan go with Jane, or Jane leave him? Even though you know the story this show involves you and fosters suspense. 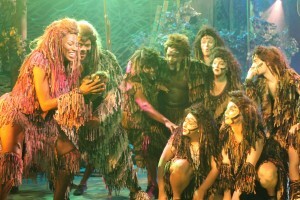 It is the musical based on the Disney movie that with a Phil Collins score, its entertainment fusion! Mr. Stevens has always wanted to play Tarzan since seeing that movie. Well last night he was, and a memorable one. But, better than the movie, these characters were very real. The scenes crisp, short, very telegraphic of what is happening. I spoke to a mom on the way out with her 4 year old daughter. The mother said she loved the show, and the 4 year old said she liked it too. Mom said here daughter did not get restless or sleepy at all. Ungowa! You will love it!